SANFRANCISCO ? Although constrained budgets may spur U.S. federal agenciestoestablish collaborative space missions, these joint ventures areinherentlymore complex and result in higher overall costs than independentprojects,according to a new National Research Council report. Thereport'sprimary recommendation is that agencies avoidcollaborative Earth-observingor space science missions, said Daniel Baker, director of theLaboratory forAtmospheric and Space Physics at the University of Colorado, Boulder,andco-chairman of the NRC committee that drafted the Nov. 23 analysis"Assessmentof Impediments to Interagency Collaboration on Space and Earth ScienceMissions." Ifgovernment agencies have a compelling reason to collaborateon a specific mission in spite of that warning, agencyofficials shouldtake great pains to clearly define the scope of the project as well astheroles and responsibilities of each team member, according to thereport. Evenwhen there is a compelling reason for agencies to work together ? forexample,if one agency has unique capabilities that are deemed essential to amission?ssuccess ? the NRC report recommends ways to structure that cooperationwithoutsharing overall responsibility for the project. One agency could builda scientificinstrument for inclusion on a spacecraft built by another agency, forinstance,or two agencies might opt to share data produced by a mission insteadofjointly managing the mission, Baker said. "Experiencehas shown that collaborative projects almost invariably lead toincreasedcosts," the NRC report said. "When additional participants join aproject, the basic costs remain, but the costs of duplicatingmanagementsystems and of managing interactions must be added." Asa result, collaborative efforts that involve more than one U.S.governmentagency in a domesticspace program result in higher overall costs forthe U.S.government, according to the report. While international cooperativeventuresalso are more costly than independent programs, those projects can savemoneyfor the U.S. government because international partners are absorbingsome ofthe mission?s expense, the report said. Althoughinternational cooperative projects share many of the same challenges asdomestic interagency programs, multinational efforts traditionallybenefit froma higher degree of planning at the outset, Baker said. That extensiveplanningis an important ingredient for any successful interagency partnership,according to the report. ?Inthe event of a decision to proceed with collaboration, conscious stepstomitigate risk are required at every stage of development ? fromidentificationof the potential partner agencies and assignment of their respectiveroles;through project definition, management, and acquisition; to workingwith the administrationand Congress to ensure mission success,? thereport added. Toreach its conclusions, the NRC committee studied a broad range ofdomestic andinternational collaborative efforts, including the Advanced CompositionExplorer spacecraft, a NASA satellite which provides space weather datato theNational Oceanic and Atmospheric Administration (NOAA), and theNationalPolar-orbiting Operational Environmental Satellite System (NPOESS), anambitious mission that was managed jointly by NASA, NOAA and the U.S.DefenseDepartment to establish a spacecraft constellation capable of replacingboththe U.S. DefenseMeteorological SatelliteProgramand NOAA?s Polar Operational EnvironmentalSatellites. 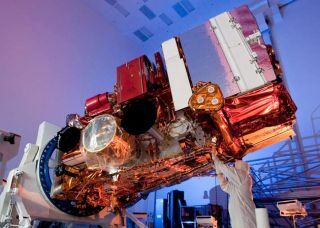 TheNPOESSprogram,which was plagued by cost overruns and schedule delays, was canceled byU.S.President Barack Obama in February and replaced by two distinct effortstodevelop weather satellites to address civil and military needs. NPOESSis the "poster child" for the problem of interagency collaboration,Baker said. ?We should have put a picture of NPOESS on the cover ofthis report.? Inits report, the NRC panel pointed out some of the inherent challengesinNASA-NOAA partnerships. Althoughthe two agencies have complementary missions, NASA?s program is focusedonresearch and development of space instruments, while NOAA has a widerange ofoperational and regulatory responsibilities. The two agencies work welltogether in cases where NOAA can use NASA research data and models tofulfillits responsibilities. "Yetthe issue of the technology transfer from research to operations isstill athorny one that bears heavily on interagency collaboration," accordingtothe report. "For example, when a NASA-funded research satellite thathasproved to provide valuable data for operational applications reachesits end oflife, NASA has no research requirement (and consequently no funding) tocontinue collecting the same type of data, even though a need for thisvaluabledata still exists." Thatwas the case when NASA?s Moderate Resolution Imaging Spectroradiometerproveduseful in detecting fires, when the space agency?s Sea-viewing WideField-of-view Sensor proved adept at spotting harmful algal bloom, andwhenNASA?s Tropical Rainfall Measurement Mission offered useful data onprecipitation, the NRC report said. "Problemsin executing the transition to operations, in extending the lifetime ofEarth-observing missions, and in sustaining measurements over long timeperiodsin support of climate research are all examples of a misalignmentbetween NASAand NOAA roles and responsibilities and their budgets," the reportadded. Inspite of that inherent conflict, several NASA-NOAA collaborations haveworkedwell. Thereport points to the GeostationaryOperationalEnvironmental Satellites as a successful project in whichNOAA establishesrequirements, provides funding and distributes satellite data, whileNASAoversees procurement, design, development and launch of the spacecraft. Thereport also cites the Ocean Surface Topography Mission (OSTM), aneffort tomeasure sea-surface height, as a successful collaborative project thatrequiresa higher level of coordination among agencies. For OSTM, the Frenchspaceagency, CNES, built the spacecraft and instruments were provided byNASA andCNES. InOctober 2008, after CNES and NASA confirmed the satellite and groundsystemwere functioning properly, operations were turned over to NOAA and theEuropeanOrganization for the Exploitation of Meteorological Satellites. Inspite ofthat high level of coordination, the effort succeeded in part becauseNASA andNOAA had clearly defined roles, according to the report.